Simple, quick, perfect for weeknight dinners but fancy enough for a holiday meal. Broiled in your oven and topped with herbs and green onion. 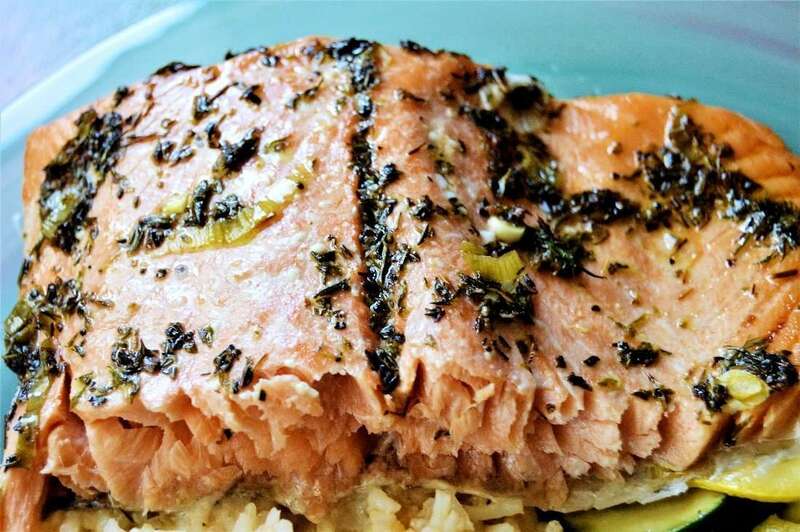 Spring Herb Salmon is heart healthy dish loaded with flavor. We all know Salmon is good for you, loaded with antioxidant amino acid, omega-3 fatty acids, vitamin B12, Vitamin D, selenium, niacin, protein, phosphorus and vitamin B6. Not to mention it has a great source of choline, pantothenic acid biotin, and potassium. 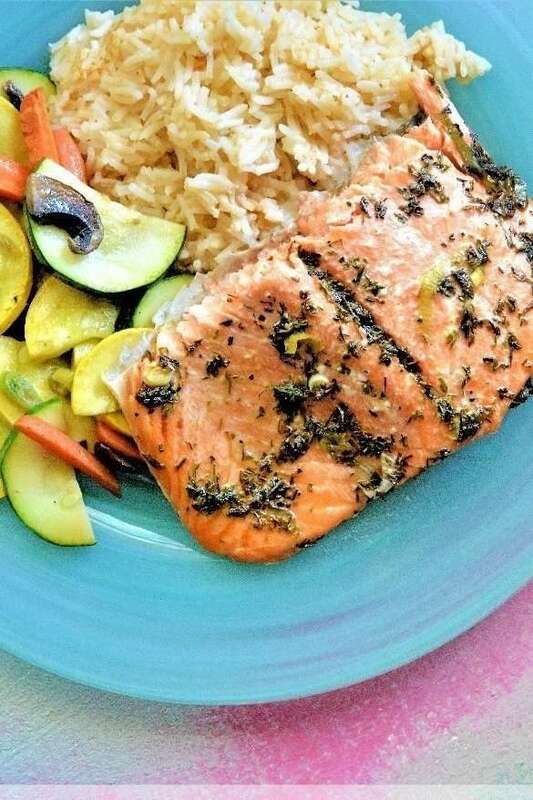 Really Salmon can be a meal all its own! This is a simple recipe that even beginners can make. The first step is to take your olive oil and whisk in your herbs; thyme, parsley, and basil. Then whisk in your sherry and green onions. All that takes about 5 minutes, this includes the time to chop up your green onion. Next is to take your fish and lay it skin side down onto a cast iron skillet or an oven safe pan. Now drizzle and spread your olive oil mixture onto the top of it. Place it into the oven and turn your oven to broil. 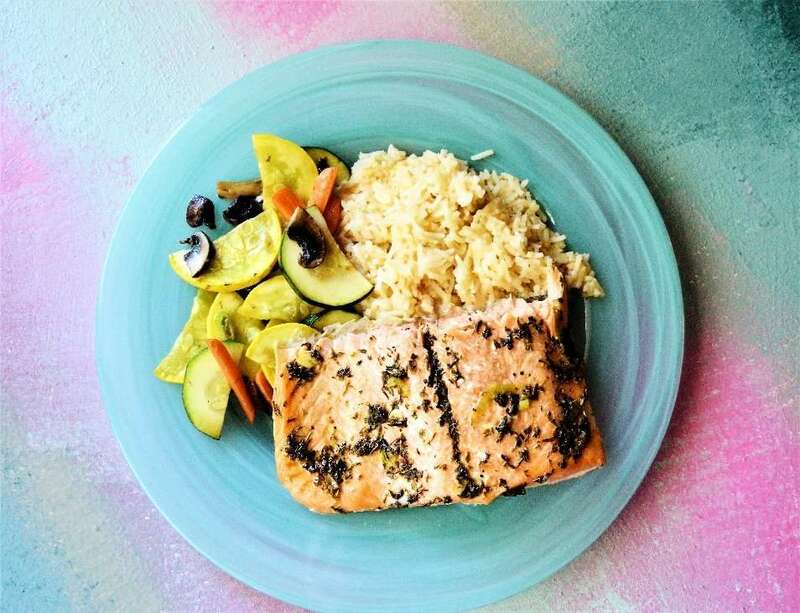 The Salmon can take anywhere from 6 minutes to 10 minutes to cook under the broiler. I suggest testing it with a fork (stick the fork into the thickest part of the salmon and twist slightly to see if the fish will flake easily) at 6 minutes and every minute after until it flakes easily. Note take the pan out of the oven to test the fish to ensure you do not burn yourself. Keep in mind that if you have a thin piece or part of any fish it will cook faster and it may be drier than the thickest side, therefore when buying fish you want one that has almost an equal thickness throughout. 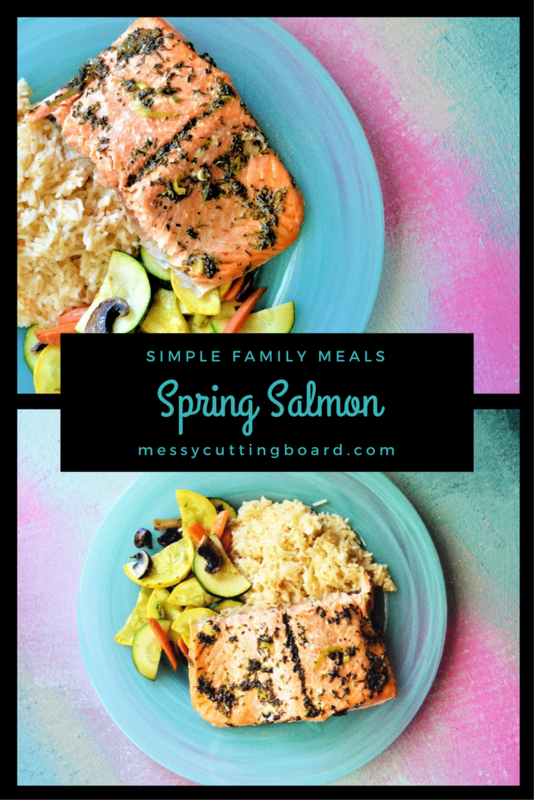 Take out of the oven when done and allow to cool slightly (about 1 minute) and serve and enjoy your delicious, flavor-packed, healthy Spring Salmon meal! Simple, quick, perfect for weeknight dinners but fancy enough for a holiday meal. Broiled in your oven and topped with herbs and green onion. 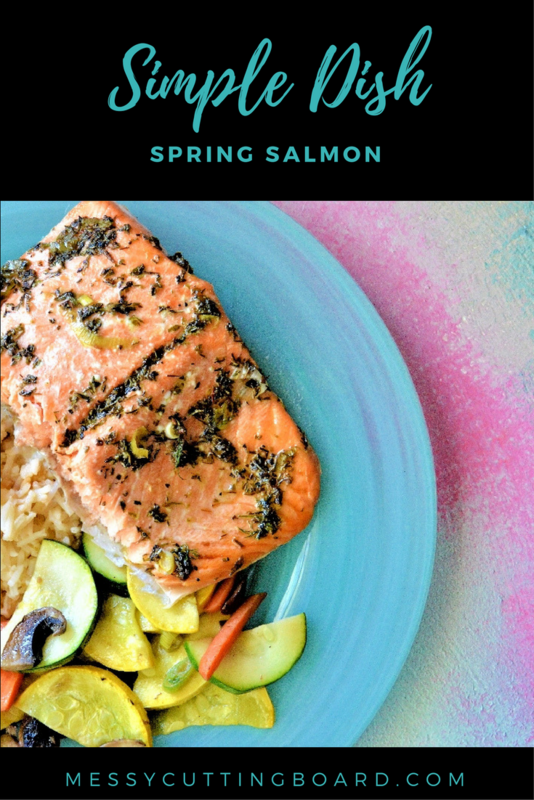 Spring Salmon is heart healthy dish loaded with flavor. In a small mixing bowl combine olive oil, garlic powder, thyme, parsley, basil, green onion and sherry vinegar. Lay salmon fillet on cast iron skillet skin side down. Place cast iron skillet in oven and turn on broiler high. Cook for 5 minutes. Remove from oven and spread contents from mixing bowl on the top of salmon. Place back in the oven on broil for 5-7 minutes, or until you can easily flake the flesh with a fork. Remove from oven allow to cool slightly (1minute). Serve and Enjoy! Yum, I love salmon. I will have to add this to my recipe rotation. This looks great and pretty easy! Will have to add it to my meal plans! Awesome!! Thank you for adding it to your meal plan! Enjoy! This looks delicious! I try to eat fish at least twice a week and I’m always looking for new recipes. Can’t wait to try this one. Thank you so much!! I am glad I could help you with a new recipe, that is great you eat fish twice a week!! I love how easy salmon is to come by these days, and how often it is on sale! Yum! I’m pinning this for later. I’m always looking for more healthy recipes, so thanks! Thank you for the pin!! I love salmon it is so easily healthy! mmm I love salmon, I could and probably eat it almost daily. I never tried it with thyme or any type of vinegar before though. Thanks for sharing. Thank you for your comment!! I love using just a little vinegar on most recipes, different kinds that is, it helps me reduce how much salt I use! I’ve been thinking of quick and healthy meals to make. Love that I’ll be able to make salmon this season. 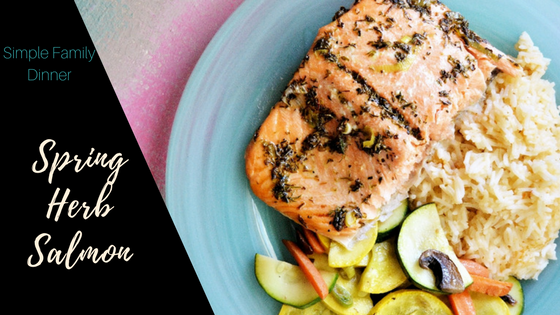 Salmon is a great healthy packed meal and it can be made year round it’s such a diverse fish!! Salmon, my favorite fish! This recipe looks amazing, and I love the fact that it can be on the table in 30 minutes. I’m definitely going to be making this dinner very soon! Cait Weingartner recently posted…Thoughts on Serendipity & Doing What You Love.